EUDAT IDs are created by the B2ACCESS upon registration. 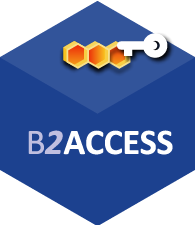 Therefore B2ACCESS is an Identity Providers for the users that do not have neither a Google account nor a Home Organization Identity Provider. In these cases, B2ACCESS offers also the tool for the managements of the EUDAT IDs. B2ACCESS is integrated with EduGain and therefore support identities from theoretically hundreds of Universities and Research institutions around the world. B2ACCESS allows group-, community- and service managers to specify authorisation decisions. Community applications that can be integrated with B2ACCESS to get user identities and attributes for Authorization and Authentication decisions. B2ACCESS is based on Unity IDM. The following picture shows the different methods of authentication and the flow within the B2ACCESS system. For further information please consult the B2ACCESS documentation.